Are you that DIY person who tries to fix everything on your own? Well this little video will be one you surely want to watch. Here I take apart an air conditioner capacitor that has shorted out internally. Usually this is obvious when the tops, sides or bottoms of the capacitor are bulging or domed shaped and your air conditioner compressor is no longer working. If your capacitor is gray and appears to be plastic, then do not try this at home. 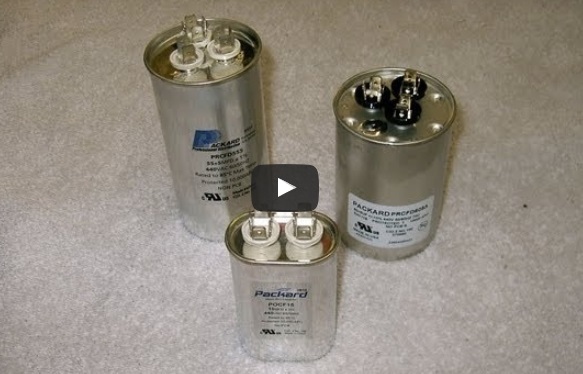 The older versions of capacitors have the potential to have PCB’s inside them. PCB’s are poisonous and are carcinogens. they must be disposed of properly according to your local hazardous waste programs. In this capacitor you can see the electrical insulating film has melted and expanded creating a blob of material inside the capacitor. This occurred when the material separating the two electrically conducting films have shorted out between them and created a spark with significant heat that the inside instantaneously boiled and melted releasing some small amounts of gas which expanded the casing creating the “bulge” witnessed in so many dead capacitors. Replacing your contactor can be very dangers due to the high voltage it can store.